"Perhaps we Haitians should tell the whole world that being the FIRST BLACK NATION is no walk in the park and we have the scars to prove it." We fought for nearly thirteen years before this day so that we could initiate this symbol of freedom for ALL slaves ALL over the world. On Sunday January 1, 1804, the Haitian slaves of yesterday started gathering at dawn at the "Place d'Armes de Gonaives". it was there that Jean Jacques Dessalines mounted the Autel de la Patrie to speak. He made his speach in Kreyol so everyone could understand him. Jean Jacques Dessalines declared that Haitians would forever live free and die free. "Cannons were fired, church bells rung, people cheered, and, they say kettles of fragrant soup joumou perfumed the air, ready to be ladled up in a mass communion." Tradition, Symbolism, or just a plain old habit? Lately, the consumption of soup joumou has become just an old habit for Haitians. It seams we have forgotten its true history and purpose. Perhaps we should re-attach the symbolism of independence to the oldest Haitian Tradition - a goold old bold of delicious soup joumou. Perhaps we should tell the story. Perhaps we should let the whole world know that we drink this soup on the first day of every year because once upon a time, we were NOT allowed to drink it. Perhaps we should let the whole world know that we are FREE and independent because once upon a time, we were not allowed to be FREE. Haitians celebrated 200 years of freedom. Perhaps we - Haitians - should tell the whole world that being the FIRST BLACK NATION is no walk in the park and we have the scars to prove it. on January 1, 2004, we once again made, drunk, and shared some Soup Joumou. It was the 200th serving of the most delicious soup on earth, our Haitian "Soup of FREEDOM". You want to know how much Haitians love Haiti? Just try to take it away from us! 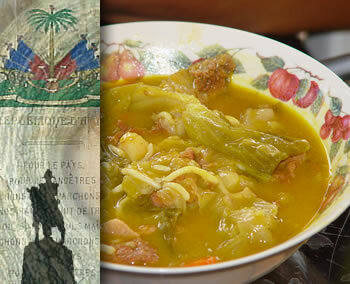 We Haitians (FIRST BLACK Nation in the world), we drink our soup joumou in our INDEPENDENCE DAY. Happy Anniversary... and Happy New year! P.S. Do we "eat" or do we "drink" soup joumou? How come most Haitien don't remember why and what Jesus our Lord did for us. Whish is more than anything in this planet. What He endure, no one was Abel to go through it, we are sinners, He did nothing. He was crush beating spat on. He died for our sin and yet lot of Haitien business work on good Friday, that not freedom our our Creator gave us that freedom. Haiti should plant more pumpkins in all departments to sell to the USA> Canada, etc., everywhere Haitians are living. The pumpkins can make some good soups and pie. Pumpkin pie is an excellent dessert and pumpkin soup is very delicious and healthy. Thank you to Woodring for a great article. Every year, I invite my friends from other islands to share my soup joumou. I'm Jamaican and when I read this, it brought me to place of gratitude and pride. When you say if you want to know if Haitians love Haiti, then take away their freedom, those are some powerful words. If only other people of color would approach their heritage the way Haitians do. I myself am in a quest to share our beautiful culture with the rest of the world. WOW!!! Thanks for this link. By coincidence my daughter and I were just discussing on this topic, She was asking me about the meaning of Soup Joumou and my answer to her was that its an old tradition that I grew up with and I just tend to follow it because of old habits and tradition, but by her reading on through this link she had a full understanding and I myself just had a revision of my Haitian History.